Saturday, Feb. 16th @ 10:00 A.M.-2:00 P.M. in RPL 300B–Spinning Yarns: Literally and Figuratively. The Ozarks Fiber Group will be here for a spin-in at the Library. Live demonstrations of spinning fibers of many kinds will be done. Materials in various stages of the yarn or string making process will be available. This is is the literal portion. The figurative part of the program will look at Arkansas and Ozark region folklore and stories. Books by Vance Randolph and other story collectors and tellers will be featured. There may even be a story or two to be told. This is a drop-in/open-house event. Come when you want–stay as long as you like. We will be working on projects throughout the day. 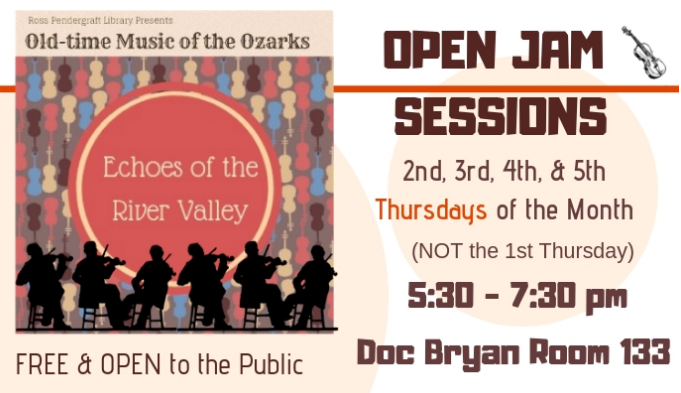 Every 2nd, 3rd, 4th and 5th Thursday @ 5:30-7:30 P.M. in Doc Bryan 133– Open Jam Session. We invite student, faculty, staff, and community members to come to a jam session of fiddlers, guitar pickers, and banjo players. You don’t need to be Doc Watson to play; the chords and notation to the songs are posted on the screen. We’ll be playing music heard during the 19th century–classic fiddle songs invented long before bluegrass. Players and listeners are welcome! Saturday, Mar. 9 @ 9:00 A.M.-12:00 P.M. in RPL 300B–Stitches in Time: The Art of Hand Quilting. Learn the art of hand quilting as it has been done for centuries. Local quilters will display hand quilted pieces both old and new. There will be a short presentation discussing the background and process of quilting by hand rather that by machine followed by a demonstration. 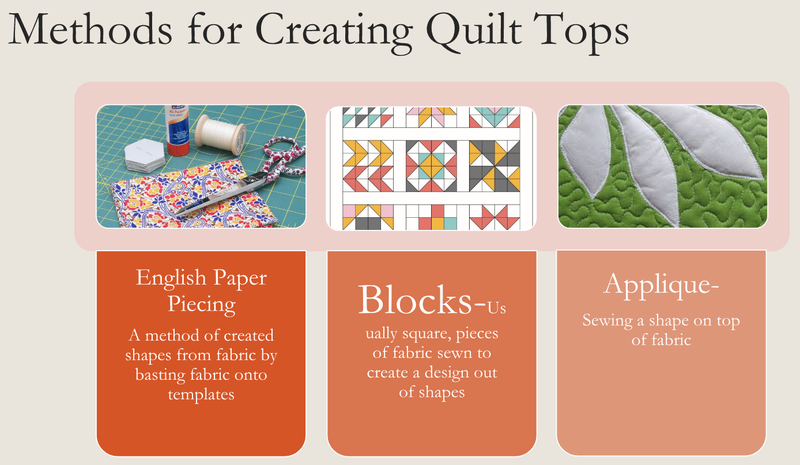 Learn more about hand piecing by visiting this guide. Saturday, Apr. 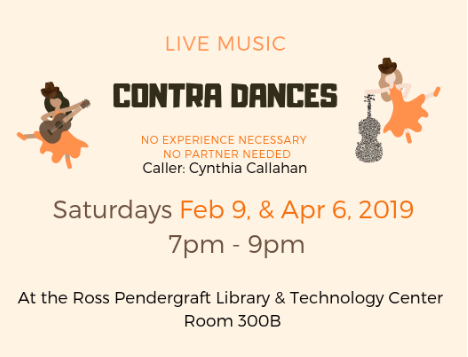 6 @ 7:00 P.M.-9:00 P.M. in RPL 300B–Contra Dancing with Live Music. An old-time contra dance, also referred to as a barn dance or square-dancing, is an informal country dance stemming from such dances in 17th century Western Europe. It has evolved just as the old-time music has. Traditionally this type of dance always uses live musicians playing fiddle tunes. No experience or partner necessary! Each dance will be taught before it begins, and no one will be left behind. More events are scheduled throughout the year. Be sure to check the calendar for more information and follow us on Facebook, Twitter, and Instagram for upcoming events, photos, and other news from the library. Saddle up for an adventure through time and space with author and professor of English, Dr. Stanley Lombardo, as we welcome him February 11th at 7:00 P.M. in the Ross Pendergraft Library, room 300B, as part of our Second Monday Author Series. 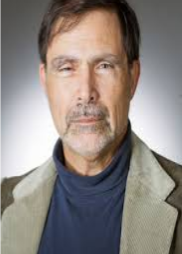 Dr. Lombardo is the author of a popular series of genre-bursting books called the The Crosstime Adventures of Carter Paxton in which a Yale-educated, buffalo hunting cowboy from the nineteenth century travels through time using an Apache medicine cave in Arizona. Already on its fourth installment, Who Murdered Shakespeare, the series delivers something to satisfy fans of western, sci-fi, romance, and historical fiction genres. Learn more about this series as well as Dr. Lombardo’s children’s books by joining us this Monday in RPL 300B. All are welcome to attend, and one lucky attendee will be entered into a door prize of one free autographed book by Dr. Lombardo. 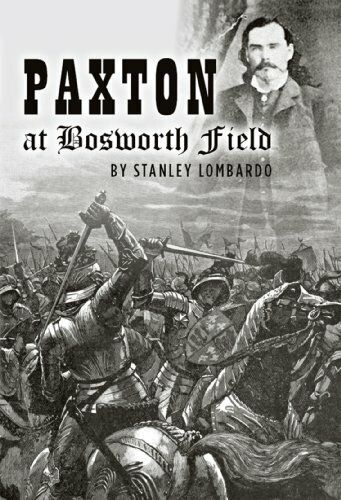 If you want to get started on the Carter Paxton series, you can check them all out at the Ross Pendergraft Library. It’s the best way to travel through time and space—no Apache Medicine Cave required.